“Snowflake Background” is stamped with black Memories ink and colored with pencils. Handmade papers are torn and layered as an embellishment with a gold charm as a focal point. The card is layered on blue and white card stock. 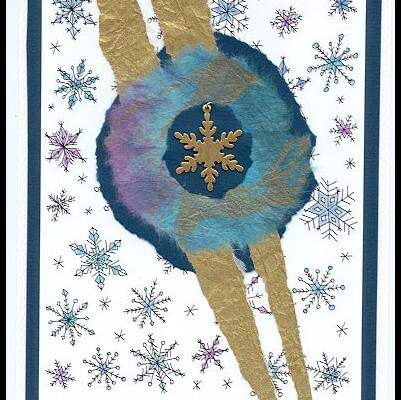 Card is by Mary Connaway who, also, drew the Snowflake Background. Previous post: Holiday Season Card Using Large Snowflake and Let it Snow!